After the success of our Carrauntoohil Summer Solstice Night Climb we're running two more Carrauntoohil Night Climbs, on both Saturday 7th August and Saturday 21st August. We're also running a Night Navigation Workshop on Saturday 28th August, designed to give you the skills to map read and navigate across the hills in darkness. Make an exciting and unique night ascent of Carrauntoohil, in darkness with head torches and guides. Stand on the summit of Ireland's highest mountain at dawn to savour the early morning calm and hopefully sunrise over the MacGillycuddy Reeks... After descending Carrauntoohil in the dawn light, enjoy a huge freshly cooked breakfast in Killarney. Meet at midnight just outside Killarney for registration and gear check. Then drive to the base of Carrauntoohil for a four to five hour walk to the summit. Relax on the summit to watch the sun rise over the Gap of Dunloe and MacGillycuddy Reeks at approximately 5am, weather permitting. Descend down through glaciated corries and high cliffs and finish this unique experience with a huge freshly cooked breakfast in Killarney at approximately 9am. Spend four/five hours on the hills near Killarney at night-time, learning map reading skills and basic night navigation techniques. This workshop aims to give you an introduction to the skills you need to navigate across the hills in darkness. It's also designed to give you the confidence and skills to descend safely from the Irish hills, should you be caught in darkness or mist on a normal day's hiking. The practical, hands-on, workshop will begin at 9pm and finish at approximately 2am and is designed for all abilities. Urhan Post Office - great place for tea cakes! Over the past few years, Nathan had consulted with me on several aspects of Business Development for Outdoors Ireland, mainly in the areas of business direction and streamlining processes. When he asked me to take on this environmental project, I was more than happy to get stuck in. I knew that Outdoors Ireland has very high professional standards across the board and was happy to help them achieve recognition for their high level of work. As well as that, Nathan genuinely counts himself extremely fortunate to work in such a stunning, relatively untainted area as Kerry, and values the conservation of its natural beauty. Equally, I appreciated that Nathan trusted my work, and would let me get on with things in my own way. The task was to incorporate and demonstrate sound environmental practices across the company: in all processes and procedures, in dealing with clients and suppliers, and in company information. What this really meant was considering the environment in everything we do ourselves, as well as encouraging awareness in our clients and in anyone else we deal with, such as restaurants, hotels and shops. These practical principles would then form an Environmental Policy that we could stand over, and which would guide the company in future. At the Outdoors Ireland brains-trust /nerve-centre / madhouse, we looked at any and all ways that we could improve things from a green point-of-view: using recycled paper, inks and other products; using more electronic forms of marketing and communication; being more responsible energy-wise etc. We pulled apart all staff procedures to ensure that they are fully informed and pro-active on environmental issues. We put fail-safes in place to minimise waste, spread the Leave No Trace message, and encourage interaction and feedback from our customers on this area. Our aim was to provide information to our clients so that they would be able to easily do their bit for the environment while taking part in our courses. Encouraging public transport or bikes while in the area, using responsible accommodation and local food providers, and making them aware of our own policies were some of the angles here. We sent out questionnaires to the various hotels, restaurants, transport companies and so on that we regularly use, to find out what environmental practices they had. The idea here was to inform them of our view, encourage them to think more green, and to demonstrate that we are moving towards working exclusively with highly responsible companies. So with all that and so much more done, we had our audit and the nervous wait for the result. Being honest, we felt we put a lot into it, but were probably on target for a high Silver award, so to get Gold was extremely satisfying. Knowing that Outdoors Ireland is the only adventure company in the country to get Gold makes it sweeter again (of course we would welcome all tourism providers being at gold standard but it’s nice for work to be recognised!). Another good job done but also just the start of something. Part of our policy was to aim for continual improvement, as we look for in all areas of the business. So hopefully on-going work and communication with customers will keep Outdoors Ireland at the top of the pile when it comes to responsible tourism in Ireland. Here's some upcoming places on adventure trips and training courses happening in Killarney over the coming weeks. Apart from these, we also have regular kayak trips, rock climbing and Carrauntoohil guided ascents. Thank you and well done to all the climbers who joined us on Sunday night and Monday morning for our night climb of Carrauntoohil. Sunrise was spectacular and so was breakfast afterwards! 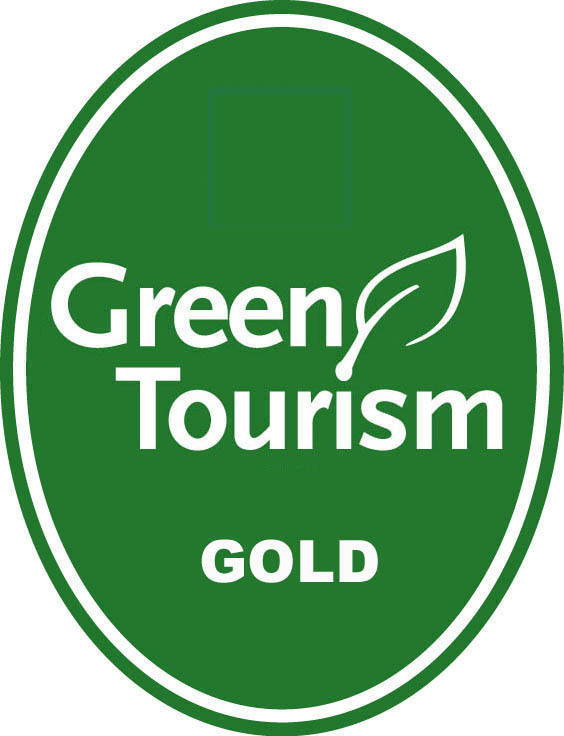 We have just achieved a gold award for green credentials and enviromental awareness, thanks mainly to Darragh O Sullivan for his hard work and also Failte Ireland for their support. 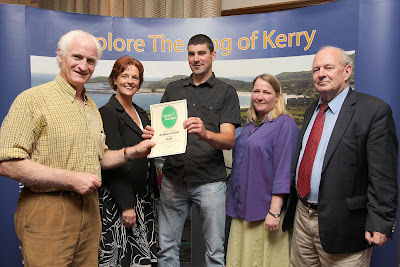 We are the first adventure company in Ireland to achieve gold and pretty delighted about it! The final countdown for bookings has begun as places are filling quickly and Sunday night is looming. Click here to book or contact Nathan / Ruth on info@outdoorsireland.com or +353 (0) 86 860 45 63. We ran a rock climbing competition at the beginning of this month, with the two winners announced today, by Roisin Finlay, editor of Ireland's only outdoor magazine, Outsider. Congratulations to Brian (Sheer Luck) and Lorraine (Dakota Dream) who have just won a free place on our Learn to Rock Climb Course! Thanks to Roisin Finlay who chose the winners and a huge thanks to everyone who took the time to enter! As a thank you to everyone who entered we'd like to offer you a 20% discount on a Learn to Rock Climb Course before the end of 2010. River Kayak Trip last weekend, down the Laune River, which flows from Lough Leane to Killorglin. For more river kayak trips contact us at www.outdoorsireland.com or +353 (0) 86 860 45 63. Well 309 climbers are now safely up and down Carrauntoohil, having participated in Focus Ireland's Four Peaks Challenge; where teams climb the highest mountain in each of the four provinces, beginning with Ireland's highest - Carrauntoohil. We're lucky to work with Focus Ireland, both training the teams beforehand in map reading and mountain skills, and then providing safety cover on Carrauntoohil for the actual challenge itself. Our brief is to keep track of teams, so at any stage we know where on the mountain teams are; keep teams out of hazard and mishap as best we can, and also stabilise and deal with any injuries or incidents that may occur. Teams are generally well prepared and we've had no major incidents or injuries over the years, plus the weather is usually pretty good, which makes things a little easier. The climbers route is up the Hydro Track to the top of Caher, across the Caher Ridge to the summit of Carrauntoohil; then returning the same way. Myself and my team of twelve mountain instructors and guides meet at the Hydro Track at 730am, before using our four wheel drive jeep to drive as high as we can go. Here we run through the day's action plan, emergency plans, share out safety equipment and perform radio checks with the VHF radios, which are vital on the mountain. The equipment each member of my team carries includes map and compass, head torch, spare clothing, first aid kit, survival unit and survival bag, walking rope, high visibility jacket and VHF radio. We have two first aid tents between Caher and Carrauntoohil. These are stocked with flasks of hot drink, neck braces, emergency clothing and sleeping bags, plus survival bags. I have a first aid officer - Dave K - who moves freely over the mountain, ready to deal with minor incidents. I have a rescue officer - Dave R - who is fixed in position at one of the first aid tents, ready to deal with major incidents. The two Daves and I have a separate radio channel to communicate freely on, free from the general radio traffic between the rest of the mountain marshals. There are four checkpoints across the mountain, which Four Peaks climbers check into, both on the way up and the way down. This way we know where teams are and what time they were at their last checkpoint. Darragh is based at the jeep all day, tracking teams and liaising with mountain marshals. All other marshals are then fixed at danger zones to prevent any incidents, or deal with them if they should happen. I drove up the Hydro Track initially on Friday morning at about 6am and it was a beautiful morning with faint sunlight just touching the summit cross on Carrauntoohil, however when all my team arrived at 730am the peaks had disappeared behind swirling grey cloud. Over the course of the day this cloud descended lower and lower, eventually all the way down to Checkpoint 1. although the valley was warm and sunny it was a very different climate on the mountain tops, with incredibly poor visibility and a gusting breeze in places. Poor Tadhg, at Checkpoint 2 and John at Checkpoint 4 seemed to be the only two people being constantly rained on! I haven't often seen visibility as poor as what we experienced on Friday, with peoples voices emerging out of the thick swirling mist, long before their figures appeared. It's a huge credit to all the climbers taking part in the challenge that they all safely and competently navigated their way across up to Caher, across to Carrauntoohil and back to base again. Teams moved pretty quick across the MacGillycuddy Reeks and we were down and wrapped up by 6pm'ish with no incidents or injuries. Fair play to all the climbers and thanks also again to my fantastic team, who kept the mountain safe for another year! Well I'm back to looking for more single men again! We've another Singles Adventure Weekend on 26th & 27th June. This will be a weekend of kayaking, rock climbing and hiking, for all abilities from complete beginner, upwards. The emphasis of the weekend will be fun, meeting like-minded people and challenge! The weekend is booked with women, but we're still looking for more men to take part. So where are all the men!? I've been told to offer free beer and that will attract the guys! If you know of anyone who may be interested please put them in touch or click on this link. Here's a piece Nationwide did on our weekends recently. Maria Mullarkey, from RTE's Nationwide, spent a day with us recently. She was taking part in one of our Singles Adventure Weekends. We've more of these adventure weekends running in June and July and are looking for a few more men to sign up!